The town is located in the Searles Valley between the Argus and Slate Ranges. Population is not quite 2,000. The same forces which created the Searles Valley where Trona sits, also created Searles Lake (dry), a natural resource containing rich deposits of chemicals, including 98 of the 104 known naturally-occurring chemical elements. Starting in the late 1870s John Searles set up around Searles Dry Lake to mine borax. Trona was officially established in 1913, as a self-contained company town, wholly-operated by its resident mining company to house employees. Employees were paid in company scrip, instead of real money. The mining company also built a library, a scrip-accepting for-profit grocery store, a school, basic housing, and minimal recreation facilities. Economic booms and busts followed. 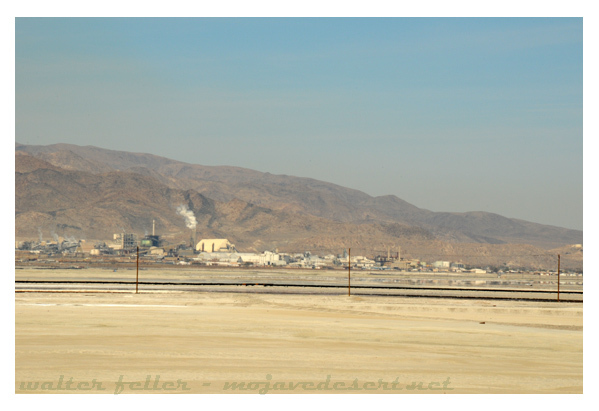 Its most notable boom occurred during WW I, when Trona was the only reliable American source of potash, an important element used in the production of gunpowder.